Barns have been used in North Carolina to protect farm animals and store crops and farm equipment since the early days of European settlement. The design of a barn was strongly related to the immigrant ethnic group who built it. In the 1600s the English constructed their primitive dwellings without using floor plans and using only unfamiliar local materials. The Germans (Lutheran, Moravian, and Reformed Protestants of diverse European origin) who settled into the sparsely populated western Piedmont region in the late seventeenth century built barns similar to European hillside barns, which allowed for easy access to upper levels. There was also the Grundscheier, a ground barn that was a single-level structure with two log cribs separated by the threshing. At about the same time, Scotch-Irish immigrants came to North Carolina, bringing their unique style of architecture to the land. In the late nineteenth century, as farming became more technologically advanced, barn designs became less individual and more practical. The size of a barn usually indicates the size of the farm on which it stands. The hill country of Appalachia and the western region of North Carolina were earlier known for crib barns, the simplest barn structure of all-a pen or crib made of rough logs held together at the corners by notches. On larger farms in the same region, cantilevered double-crib barns with lofts overhanging the cribs (usually in the front and back) were common. The lofts were used for hay storage. The barn most easily identified with North Carolina, having changed little over several decades, is the flue-cured tobacco barn. These square buildings typically measure from 16 to 20 feet per side, with a height of around 20 feet. Tobacco barns were at one time so numerous in the state that an astute observer counted 200 of them on a 60-mile stretch of Highway 86 from Hillsborough to Danville, Va. These buildings were constructed in relation to roads, fields, and other farm buildings and were never placed near a house. The construction of one was a major social event, taking 12 to 15 men an entire day. 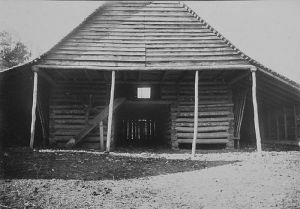 Early flue-cured tobacco barns resembled log cabins, especially in their small size (about 16 square feet). Like cabins, they were square log buildings (constructed using similar notching techniques) with no floor plan, and the spaces between their logs were filled with mud or mortar chinking. They had gabled roofs and a door in the center. The internal structural supports had to bear the inside load as well as withstand strong windstorms. Since bundled tobacco leaves are hung in tiers and fresh tobacco is 80 percent water, the internal structure of a tobacco barn 20 square feet in size must support nearly five tons of weight. The inside also had to be airtight, as ventilation control was critical to proper curing. Some tobacco barns had sheds alongside that served three purposes: they provided a shady place for the stringing operation during the very hot harvest months of July through September; they protected the furnace from rain; and they gave shelter to the attendant who slept overnight at the barn during the curing process. While the earlier tobacco barns were constructed of pine logs, later builders were forced to try other materials because of the scarcity of good pine; their efforts generally proved unsatisfactory. Frame barns were poorly insulated and needed siding; sheet metal was used, but this wasted heat. Stucco did not allow moisture to escape, and many buildings made of this material simply collapsed. By 1925, Coastal Plain tobacco barns were being built of concrete, which provided a superior method of construction. In the Piedmont region, however, the newer frame barns could not compare to the high quality of the older log tobacco barns. W. A. Foster and D. G. Carter, Farm Buildings (1922). Amos Long, Farmsteads and Their Buildings (1972). Looping tobacco in Granville County, ca. 1930. Photograph by Albert Barden. North Carolina Collection, University of North Carolina at Chapel Hill Library. 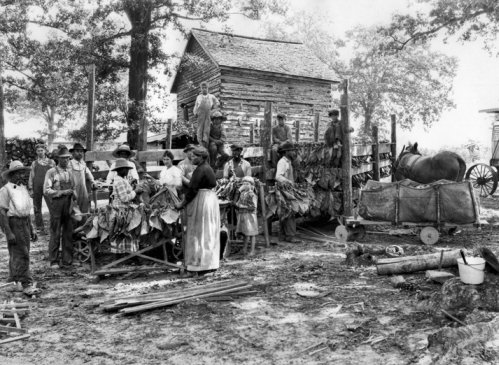 Stover Wise's Barn, Frank W. Bicknell Photograph Collection, North Carolina State Archives, call #: PhC8_423, Raleigh, NC. Available from http://www.flickr.com/photos/north-carolina-state-archives/2744143033/ (accessed August 27, 2012).